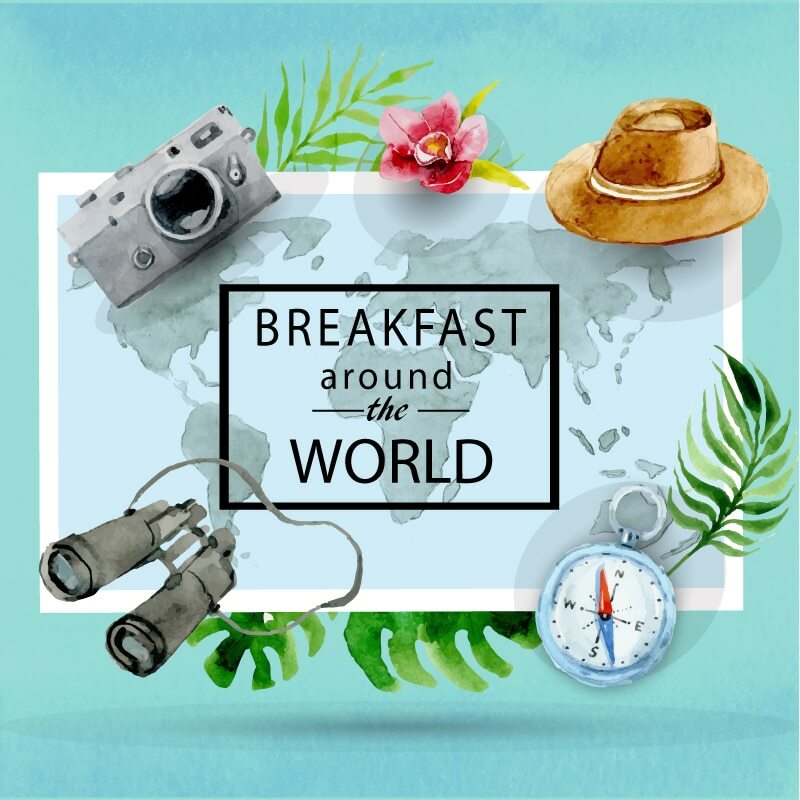 Welcome to the #5 edition of the “Breakfast around the world” post series! This time we are heading to the country of sombreros, tequila, chili peppers and many other awesome things – Mexico. I am really excited because Mexican breakfast (desayuno) really differs from the morning meals in other countries. Many say that there is nothing like it in the whole world! We’ ll see. Let’s have a look at my specially prepared breakfast table! There is one well known fact about Mexican cuisine – it is packed with spicy food. I bet it’s the first association that comes to minds of most people when asked about the eating habits of this Latin American country. That’s what I always thought about it too. However, I read somewhere that it’s a stereotype and not true at all. Well, I don’t know guys. How it can be a stereotype if Mexicans put spicy salsa on, or inside, almost every breakfast meal they have? 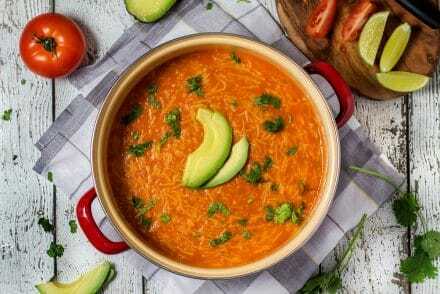 From all the world breakfasts I already made on this blog, neither Brazilians, nor Swedes, nor Moroccans, nor Russians eat chili-spiked food in the early morning! I think it’s safe to say that Mexicans love their chilies, and it’s not a stereotype at all. If you order breakfast in various parts of Mexico, there is a chance a waiter will bring you the different stuff every single time. 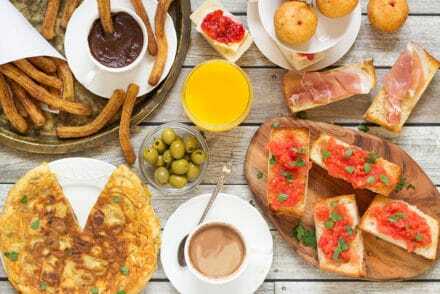 All the famous Mexican dishes, such as tacos, burritos, enchiladas, quesadillas or others can be easily eaten for breakfast and that’s what many people do. 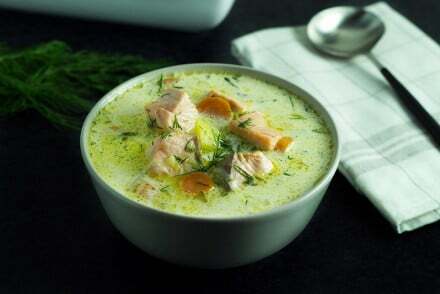 However, there do exist some foods that are considered more popular for breakfast than others. 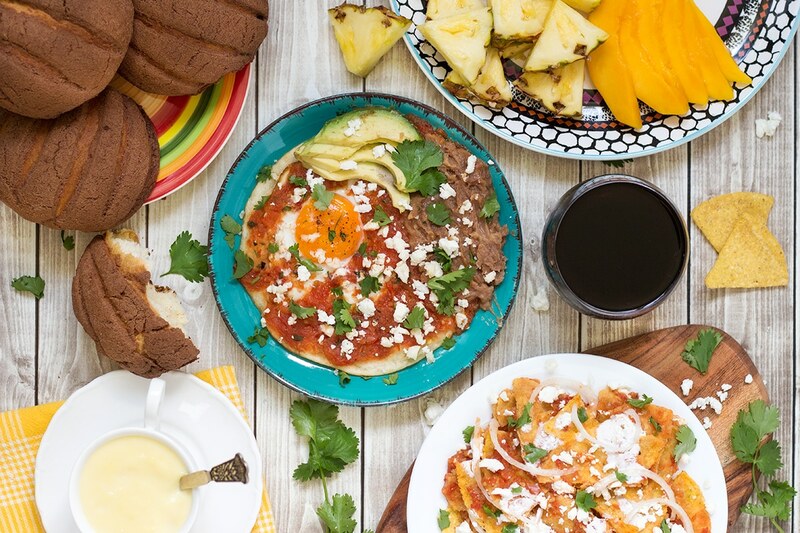 Are you ready to dive deep into the Mexican breakfast world? Let’s go! 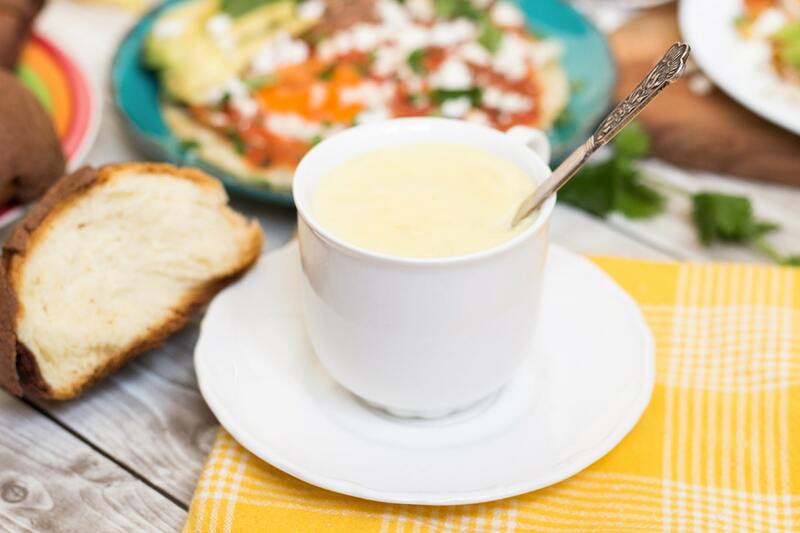 Yes, despite the fact that Mexican breakfast differs from other world’s morning meals, it still features probably the most popular breakfast staple around the globe – eggs. How would we live without them? But… We are talking about Mexico, right? Do you know what it means? Of course their breakfast eggs are spicy! 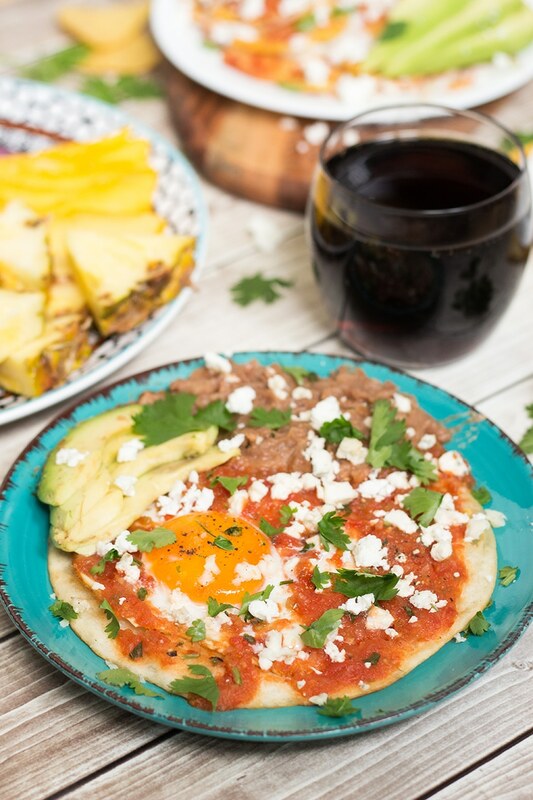 The most famous Mexican breakfast egg dish is Huevos Rancheros (recipe here). It translates as ranch-style eggs. Fried eggs are smothered in a spicy red or green salsa and served with some crumbled cheese on top and avocado and refried beans on side. They taste so good! Some of you may not know what the hell is refried beans? It’s a Mexican staple. Beans are cooked, then mashed (more information on Wikipedia). They are usually sold in cans. Even I was able to find them in the Mexican section of my local supermarket, so I guess it won’t be too much of a problem for you too. The interesting fact: Huevos Rancheros has a sister dish called Huevos Divorciados (divorced eggs). Just cook two eggs instead of one and top each one of them with a different salsa: one with red, another one with green. That’s it, Huevos Divorciados are done! Oh and keep in mind that both versions of the Mexican breakfast eggs are perfect for curing hangover. Just in case, you know. Can you imagine Mexico without tortillas? I can’t. After all, tortillas originated there, no wonder they serve as a cornerstone of Mexican cuisine today. I won’t name all the dishes Mexicans make using this thin flatbread because there are probably hundreds of them, instead I want to talk about the piece-of-heaven morning snack they make using all the leftovers from those dishes. Yes, Mexicans love their tortillas so much they make a fantastic dish using them, and then another fantastic dish using leftovers. You can’t just throw them away! 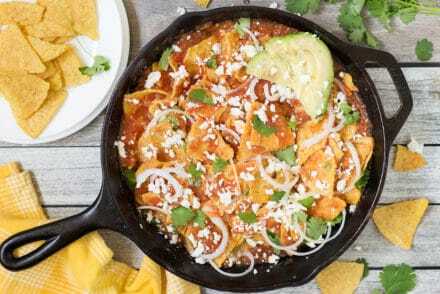 This famous leftover dish is called Chilaquiles. Of course it can be made using fresh tortillas too, but traditionally stale tortillas are used. It’s actually even better to use old ones. 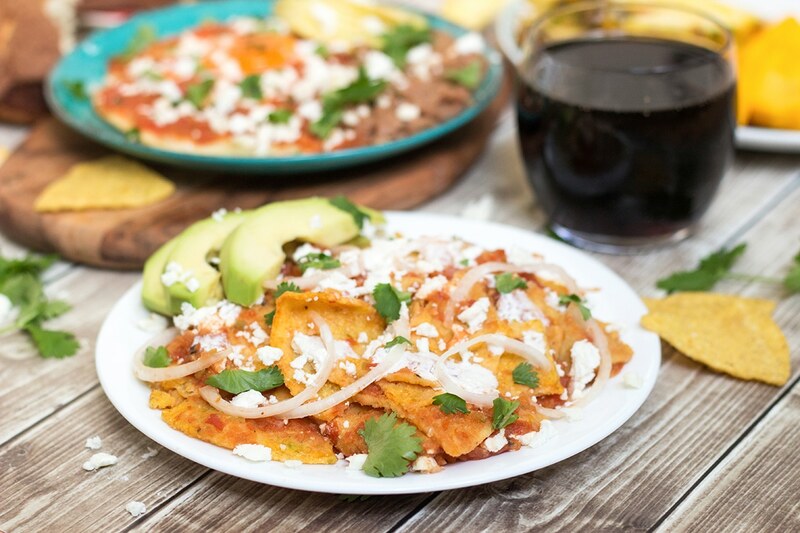 Chilaquiles are a breakfast and brunch favorite in Mexico. 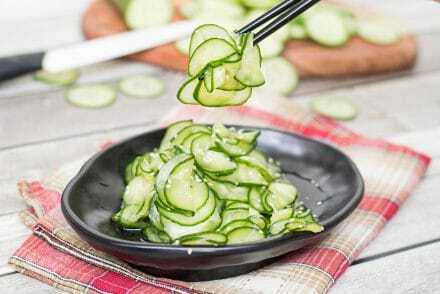 The dish itself is really simple. Tortillas are cut into triangles, then fried, and stirred in a warmed salsa sauce. They can be served with a fried egg, cheese, onions, and cilantro on top and with avocado on side. As I’ve already said, Chilaquiles are fantastic. I fell in love with them immediately. One bite and you will understand why they are so popular in Mexico and nearby countries. Mexico is not only about tacos and spicy stuff, it also has a rich dessert world. Mexican rice pudding I made a while ago is one of the most visited recipes on this blog! We won’t talk about it this time though, despite the fact that, in my opinion, it would be perfect for breakfast. So, what is Pan Dulce? It means sweet bread translated from Spanish. The tradition of making sweet bread in Mexico comes back to the 16th century, when Spaniards introduced wheat. It was not, however, until the 19th century, that Pan Dulce tradition we know now was created. Mexicans were influenced by French, that intervened the country few times, by adopting their techniques of making baked goods. Since then Mexicans never looked back creating hundreds of sweet breads in different shapes, colors and flavors. 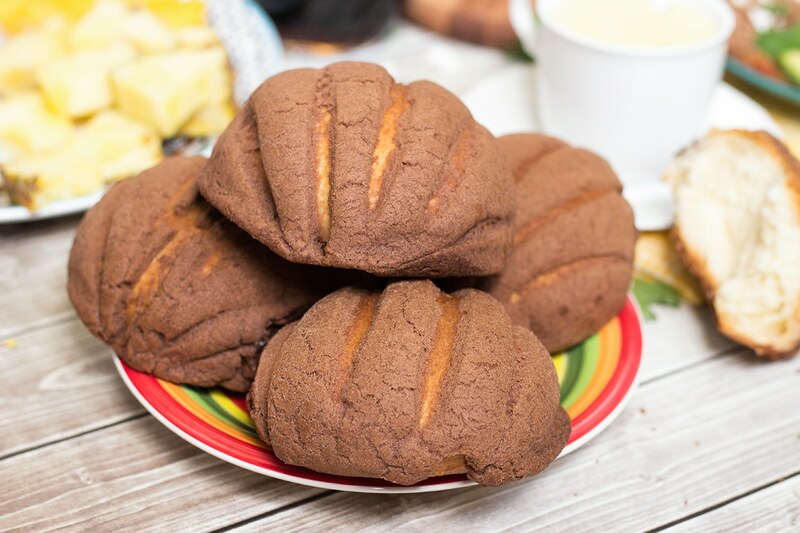 Nowadays there are between 300 and 2000 types of Pan Dulce in Mexico! They come in playful shapes and many of them are named after their look: marranitos (piglets), cuernos (horns), moños (bowties) and many others! For this Mexican breakfast, I made probably the most popular type – conchas (shells in Spanish). They really look like shells! Just look at their shell-like shape and shell pattern on the top. You can find the recipe for them here. I didn’t expect that I’ll be able to make such good looking buns by myself at home, but they turned out really well. Pan Dulce is a breakfast favorite. Mexicans love having the buns with some hot chocolate. 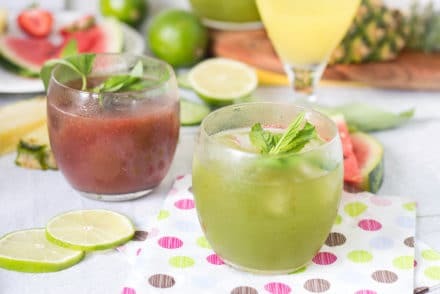 There are many beloved breakfast beverages in Mexico. First of all, the juice. It doesn’t come as a surprise keeping in mind the amount of fresh fruit available in this sunny country. Then, hot chocolate. As I already said, Mexicans love it with their sweet bread. Mexican hot chocolate differs from the hot chocolate we are used to. It’s made from dark, bitter chocolate and mixed with sugar and cinnamon. What I chose to make for my Mexican breakfast table is another traditional and popular drink – atole. It’s a hot drink thickened with corn and flavored with many different things. Typically, atole is made from masa harina (a special corn flour used to make tortillas), however I wasn’t able to find it. Instead, I found a recipe in the Mexico in my kitchen food blog that requires fresh corn instead. I don’t know if my version tastes the same, because I have never tried a real atole (yet). I did love it, though! There is one more unusual beverage some Mexicans love sipping for breakfast. It’s actually a well known drink, however it’s not considered a breakfast beverage in other countries. Coke! I read a discussion on TripAdvisor forum about the typical Mexican breakfast and I was pretty shocked when few people mentioned Coca-Cola. I did some research and found out that Mexico drinks the most Coke in the whole world! Almost two times more than the United States. Crazy! Well, not a big surprise if they really start guzzling it from the early morning. If you are a Mexican and you are reading this post, please let me know in the comments if you, or the people you know, are really having Coke for breakfast. Thanks in advance! I won’t make a separate paragraph for fruit. Mexico is a warm country so there are plenty of them there. Bananas, oranges, pineapples, mango, papaya, watermelon, guava, to name a few. Eating some fruit for breakfast is a common thing. That’s it! That’s all the information I had for you about the famous Mexican breakfast. I hope you enjoyed reading it (props to you if you read all of it!). I loved this breakfast a lot. It’s definitely not the early morning meal I’m used to, but it shouldn’t be, because I am living on the other side of the planet. Huevos Rancheros have already become one of my breakfast favorites. Thank you, Mexico! See you in other “Breakfast Around the World” posts! Mexican Breakfast is one of the most colorful and delicious ones in the whole world. Huevos Rancheros, Chilaquiles, sweet bread, and more! 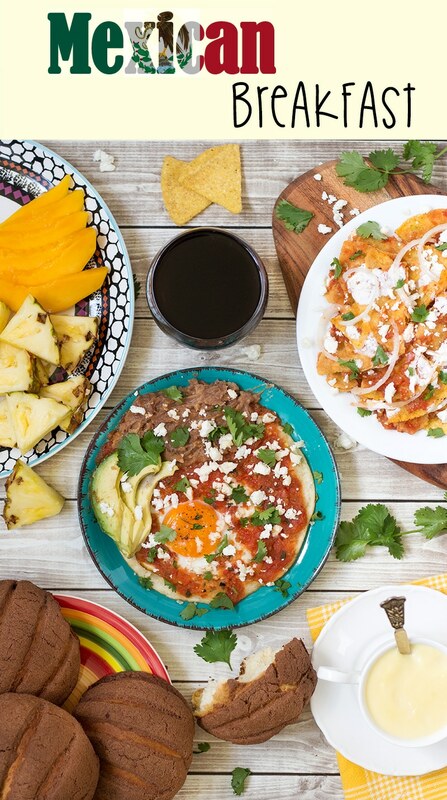 Serve all the items and your Mexican breakfast is ready! 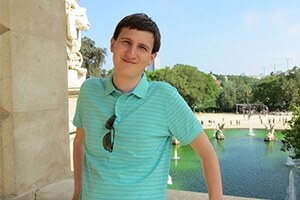 Hey Igor – love what your doing with your site – so informative! I really enjoyed this post as well, reading about breakfast in Mexico. I am glad it was useful, Henry! Husband’s birthday breakfast! He absolutely loved it!!! Ooh soo yummy! Super filling! Salsa was a hit!!! I am so happy that your husband liked it, Marie! Hi! I’m Mexican and this information is pretty accurate. About Coke for breakfast… unfortunately true. I enjoyed your breakfast reviews and, by the way, you can make atole using cornstarch instead. Thanks for the comment, Bernice! It’s nice to hear from a Mexican. I am glad that my post is accurate 🙂 Oh and thanks for the cornstarch in atole advice! Hi. I am Mexican and I agree with Bernice. Your post información is accurate. Except for coke. It is not so common to drink it specially for breakfast. People use to drink it with our main meal (which is about 2 or 3 o’clock in the afternoon) or at dinner time (about 8 or 9 in the evening). Another favourite for breakfast all over the country are tamales. There are as many tamal stiles as geografical regions in my country.